The market for microgrids – grid-connected, off-grid or hybrid – will expand at a 10.9% compound annual growth rate (CAGR) to an estimated $34.94 billion from 2016-2022, according to new market research from Markets and Markets. Ongoing cost declines in renewable energy technology – solar PV cells in particular – and battery-based energy storage, along with supportive energy policy reform aimed at reducing greenhouse gas (GHG) emissions will continue to support growth, Markets and Markets highlights in a press release. The biggest growth opportunity lies in the use of microgrids in rural electrification projects in Africa and the Asia-Pacific region. 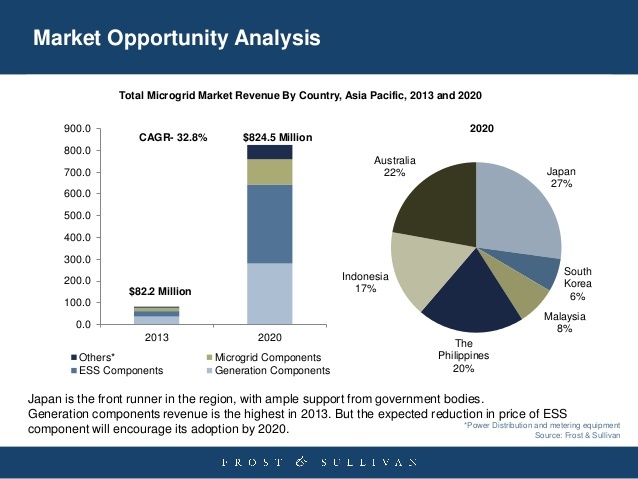 Microgrid installations and planned projects are on the rise in developed, developing and lesser developed countries, the market research provider notes. For example, governments across the APAC region, including Australia, China, Japan and South Korea, have launched solar and/or renewable energy incentives and GHG reduction programs in order to meet commitments made in the historic U.N. Framework Convention on Climate Change (UNFCCC) accord reached in Paris this past December. Remote microgrids is a leading segment of the nascent market. High energy costs, reliance on imported fossil fuels and the substantial capital expenditures required to run power lines and build out supporting grid infrastructure to remote, isolated and island communities poor in sustainable fossil fuel resources makes the prime locations for off-grid installations. This echoes findings from Navigant Research, which recently forecast the market for remote microgrids and building/facility nanogrids will increase nearly 20-fold over the next decade to reach some $196.5 billion. 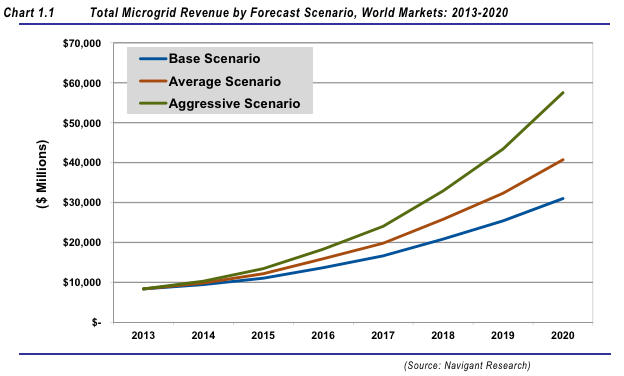 More broadly, Navigant forecast worldwide microgrid vendor revenues will increase from $4.3 billion in 2013 to nearly $20 billion in 2020. In addition to domestic companies, leading multinational corporations, such as ABB, GE, Schneider Electric, Caterpillar, and Siemens, are investing heavily in microgrids across the region. Anbaric Transmisson, Eaton, Exelon, Honeywell International, Northern Power Systems, NRG Energy, Pareto Energy and Spirae are also actively working to expand their microgrid activities.